Salt Lake City is a popular tourist destination all year long. Winter is the peak season because of all of the ski slopes in the area. Summer is another peak season because schools are on break and many people enjoy the great outdoor activities like hiking, biking, and enjoying the lake. Spring is a good time to visit because there are less crowds, but with rain and melting snow, the ground can be soggy making some outdoor activities difficult. 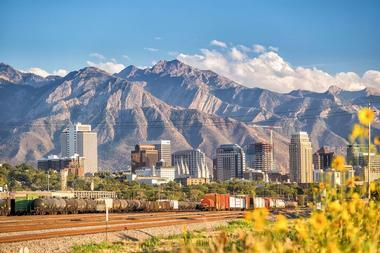 The fall months from September to October are the best times to visit Salt Lake City. There are less crowds than during the peak seasons and you will appreciate the low room rates. January is the chilliest month of Salt Lake City and also brings the most snowfall in the year with an 11 inch (28 cm) average. The average high temperature is 38°F (4°C), while the average low temperature is a freezing 26°F (-3°C). In February, temperatures climb a handful to 44°F (7°C) for the average high temperature and 31°F (-1°C) for the average low. Snowfall decreases to 10 inches (25 cm). Salt Lake City remains a winter wonderland making it a great time to enjoy winter sports. Salt Lake City Weather in March: The cold weather continues in March despite the arrival of spring. The average and average low temperatures range between 53°F (12°C), 38°F (3°C). With the increase in the temperature averages, the snowfall average decrease to 6 inches (15 cm). April sees the lowest amount of snowfall in the year with an average of 3 inches (8 cm). Precipitation is also at its highest in the year with Salt Lake City receiving 2 inches (59 mm) of rainfall. The average high temperature makes a considerable climb to 61°F (16°C), as does the average low temperature which settles at 43°F (11°C). In May, the climate starts to get even warmer as the last month of spring. The average high and average low temperatures are 71°F (22°C) and 52°F (11°C) respectively. 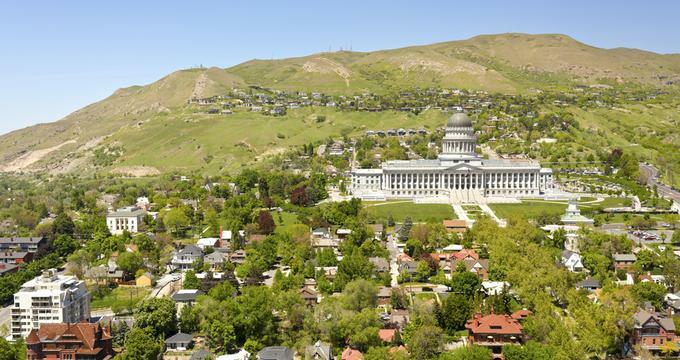 Salt Lake City Weather in June: Summer arrives and brings sunnier days along with it in June. The month receives 358 hours of sunshine along with hot summer days. Average high temperatures climb to 82°F (28°C). Evenings bring cooler weather as the average low temperature is 61°F (16°C). July is the hottest month of the year with the average high temperatures reaching a stifling 90°F (32°C). As the peak month of summer, July is the sunniest month out of the year with an expected 377 hours of sunshine. This month also has the lowest precipitation rate with an average rainfall below nearing 0 inches (15 mm). Low temperature is 69°F (20°C). In August, the average high and average low temperatures decrease ever slightly to 89°F (31°C) and 67°F (19°C) respectively. This makes August the second hottest month in Salt Lake City. Salt Lake City Weather in September: Fall arrives in Salt Lake City in September, bringing with is much cooler temperature. The average high temperature alone drops over 10 degrees to 78°F (26°C). The average low temperature also makes a steep decrease to 58°F (14°C). October sees another big drop in climate. The average high and average low temperatures range between 65°F (18°C) and 46°F (8°C). In November, snow starts to fall again in Salt Lake City with a 7 inch (18 cm) average. The average high temperature peaks at 50°F (10°C) while the lowest temperature average bottoms out at 36°F (2°C). December is the second coldest month in the year as the average high temperature hits a maximum of 40°F (4°C). The low temperature average is 27°F (-3°C). December also gets 135 hours of sunshine, one of the lower average of sunlight annually. Utah is filled with gorgeous natural wonders to visit. For those who are interested in visiting the Zion National Park, the best time to come is between April and October, with the least crowds the closer it is to winter. The nearby Bryce Canyon National Park is best visited during spring or fall, but if you prefer to avoid crowds in general, come between December and February. Meanwhile, outdoor activities in the Arches National Park is most ideal between September to November. The best time to visit Salt Lake City is between September and October when hotel prices are low and temperatures are much more manageable. 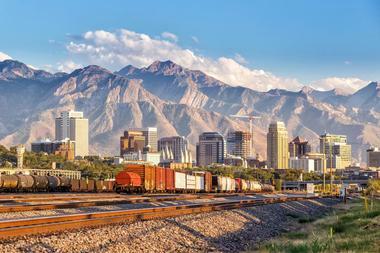 There are direct flights to Salt Lake City from many cities around the country and Canada. The Salt Lake City International Airport is served by 10 airlines and there are more than 650 flights per day. One unusual thing about this airport is its large collection of art: it’s worth taking a look at as you pass through the terminal. For those who like to ride trains, Amtrak provides several trains per day: the city’s station is on South 600 West. Salt Lake City is easy to get to by car via I-80 or I-15. Several bus companies including Greyhound provide service to Salt Lake City. The Salt Lake City International Airport is only ten minutes from the downtown area. There are several ways to get from the airport to the city. The Utah Transit Authority provides a rail service called the Trax Light-Rail service from the airport to the city. The airport station is just outside of the terminal and trains run about every 15 minutes. There are several car rental agencies at the airport for those who wish to travel by car. Shuttle and limousine companies have counter service in the baggage claim area. Some hotels provide shuttles from the airport to your hotel. There are also taxis that take visitors from the airport into the city. Salt Lake City has an excellent public transportation system that includes buses, light rail, and commuter trains: it is operated by the Utah Transit Authority (UTA). You can get from the airport all the way up to the ski resorts by using this public transportation system. The commuter trains are called FrontRunner: they run six days a week and there is no service on Sunday. The Trax Light Rail system consists of three color coded lines: all three lines converge in downtown Salt Lake City. 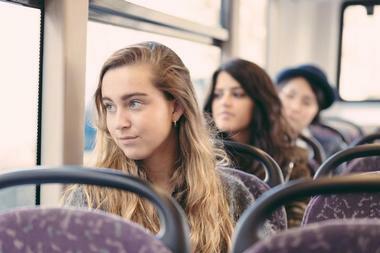 Buses have routes that provide service all across the Salt Lake City area: they also provide a connecting service at many of the FrontRunner and Trax stations. In addition to the UTA public transportation system, there are some other ways to get around Salt Lake City. GREENbike is a bike sharing program with 20 bike stations where you can pick up and later drop off your bike. Biking is so popular in the Salt Lake City area and this a very good option for getting around the city. Because of the city’s wide streets and ample parking, getting around the city by car is made easy. Street parking is metered and some parking lots are free with validation from nearby restaurants and merchants. If you need a taxi, ask your hotel to help you make the booking. Some areas of the city like Temple Square are walkable. Salt Lake City is a great place to get a great meal. There are upscale fine dining restaurants, family friendly restaurants for those on a budget, and eateries serving cuisines from around the world. 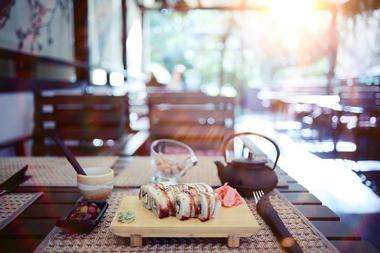 Many restaurants prepare dishes using locally produced ingredients. For breakfast, try the Market Street Grill in downtown, the Park Cafe across from Liberty Park, Finns Cafe which opened in 1954, Eggs in the City, and many more. Salt Lake City has its fair share of food trucks. Some of these serve typical food like burgers, while others serve ethnic food. Some of the inexpensive restaurants you can try in Salt Lake City include Cotton Bottom, Settebello, and the Beerhive Pub. The first department store in the United States opened in Salt Lake City in 1868, so the city has a long history of shopping. Today there are antique shops, book and music stores, specialty boutiques, and malls and shopping centers. 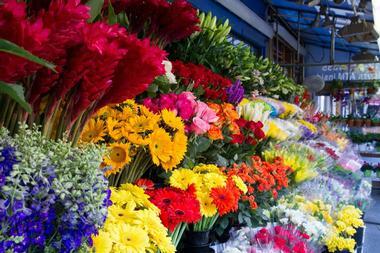 One of the most popular shopping destinations is the Gateway on North Rio Grande Street. It is a large open-air shopping mall with a dining and entertainment center. Covering two city blocks, it features 90 shops, restaurants, museums, movie theaters, and other attractions. For handmade quilts check out Mormon Handicraft on East Fort Union Boulevard. Many Salt Lake City stores are closed on Sundays. 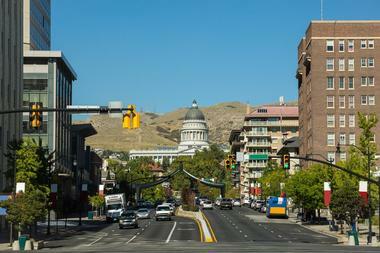 Salt Lake City is made up of several neighborhoods including the downtown area. 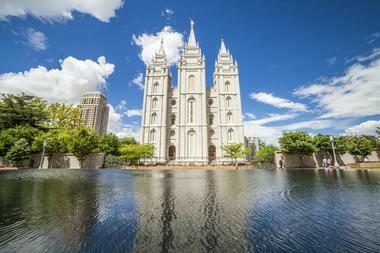 Here you’ll find Temple Square in the center of the business district. There are many hotels here as well as restaurants, stores, two shopping centers, a concert hall, convention center, and a theater. 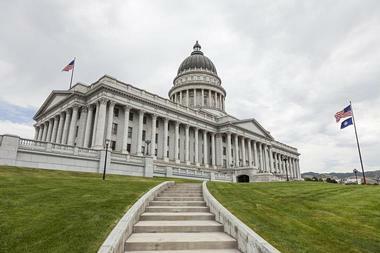 Capitol Hill is home to the Utah State Capitol Building as well as beautiful old houses. The Marmalade District lies to the west of the Capitol area. It was named for the many fruit and nut trees planted by the early settlers. The Avenue District is east of the Capitol: here there are many old homes built by successful merchants and miners during the silver boom. 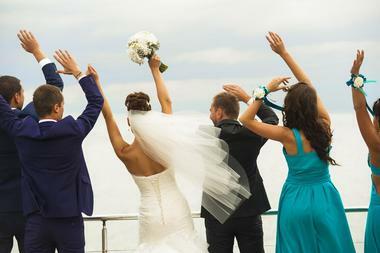 Surrounded by all of the beautiful scenery, Salt Lake City is a popular destination for visitors to get married. A marriage license can be obtained at the Marriage License Division of the Salt Lake County Clerk office. Hotels that can serve as wedding venues include the Salt Lake City Marriott Downtown at City Creek, Grand America Hotel, DoubleTree Suites by Hilton Salt Lake City, and Hotel Monaco Salt Lake City. The city offers some unique wedding venues such as Log Haven, a historic log mansion on 40 acres of land; Grand Hall at the Gateway in the restored Union Pacific Depot; Heritage Gardens; Snowbird Ski and Summer Resort; and the Old Meeting House. Where you choose to stay depends on your reason for visiting Salt Lake City. There are hotels and motels in the downtown area and resorts in the nearby mountains. Luxury properties include the Grand America Hotel, Hotel Monaco Salt Lake City, the Little America Hotel, the Sheraton Salt Lake City, and more. Other downtown choices include budget hotels and motels such as Days Inn, Super 8, and Econo Lodge. 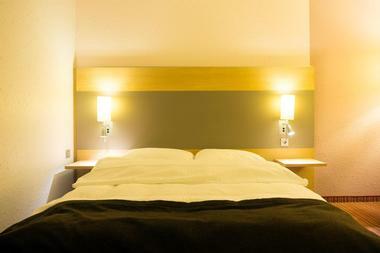 Slightly more expensive chains include Comfort Suites Airport and Hampton Inn Downtown. There are also bed and breakfasts, inns, and pet friendly accommodations. There are campgrounds and RV parks in the Salt Lake City area. Mountain resorts offer luxury in the wilderness.